The folks at the non-profit Electronic Frontier Foundation have just released a new tool to help you maintain your privacy while using the Internet. Called Privacy Badger 1.0, the free add-on for the Google Chrome and Mozilla Firefox browsers blocks known trackers from collecting data on you. It doesn’t block ads – just the flow of your information to advertisers. 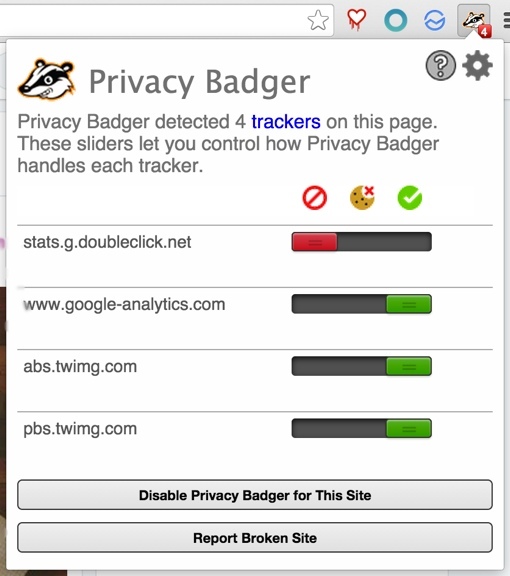 Once installed, you can see the list of potential trackers active on the current page you’re visiting by clicking the Privacy Badger icon. This information is color-coded: red means the tracker has been blocked entirely, yellow means it’s been partially blocked, but cookies and other tracking features may be required for the site you’re visiting to work properly. Green means nothing is being blocked yet. Privacy Badger is designed to learn as you use it – it starts by allowing all trackers, and then starts targeting the nefarious ones as soon as it learns what they’re up to. The nice thing about Privacy Badger is that it works silently in the background to protect you – it seldom requires any interaction with you. Of course, you can enter Privacy Badger’s settings at any time to manually change blocking settings. It’s a solid addition to the existing pro-privacy tools in Mozilla Firefox and Google Chrome. You can learn more about the free Privacy Badger browser add-on and download it for yourself at the EFF’s Privacy Badger landing page. You might also want to check out our picks for the best browser privacy tools and these 6 most important steps to staying safe on the Internet.